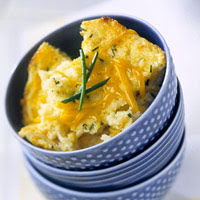 We've made the traditional Southern favorite, cheesy grits, with cream-style corn for an extra-rich meal. It's hearty enough to be a meatless main dish. In a medium saucepan bring water and chicken granules to boiling. Gradually stir in grits. Remove from heat. Cover and let stand 5 minutes. Stir in onion and the 1/2 cup cheese. Stir in eggs, milk, and corn. Transfer to a lightly greased 1-quart casserole. Bake, uncovered, in a 350 degree F oven for 45 to 50 minutes or until set in center. Sprinkle with the remaining cheese. Let stand 1 to 2 minutes before serving to melt cheese. Makes 4 servings. Calories 255, Total Fat 11 g, Saturated Fat 6 g, Cholesterol 131 mg, Sodium 566 mg, Carbohydrate 28 g, Protein 12 g.
This entry was posted on 2:31 PM and is filed under Vegetables . You can follow any responses to this entry through the RSS 2.0 feed. You can leave a response, or trackback from your own site.